Sorry! Sliders was described to me as a "poor man's PitchCar" (since it's about $20 instead of $80). This made me immediately start looking for a copy of it. In Sorry Sliders, the goal is to move all of your pawns up to the "Home" scoring region. To do this, you take four "slider" pawns, and you roll them up the ramp onto the scoring board. After each player has slid all of his pawns, you score points based on where the pieces landed. 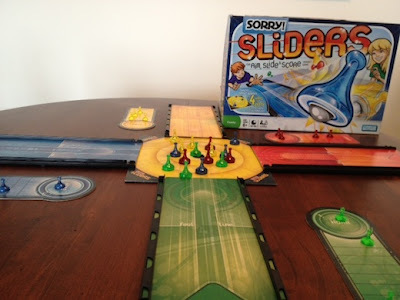 Each "slider" can move one scoring piece, and to move a piece onto "Home", you must get the exact score that you need. Also, in true Sorry! fashion, if you have a slider land in one of the corners, or go off the board, then your top scoring pawn (that hasn't reached "Home" yet) goes back to the starting position. Keep playing rounds like this until one person has moved all of their pawns to "Home." The first thing that I like about Sorry Sliders (aside from the price) is that it is quite customizable. There are several different setups that you can play. There are four different "ramps" (for lack of a better term), and you can set these up on each side of the scoring board, or you can stack two in a row opposite the scoring board. 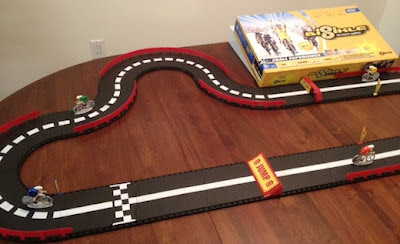 You can also set them up so that you form a right angle with the tracks, or even stack three or four ramps in a row. Finally, there are different scoring boards to make the game easier or harder - the easier one includes an "automatic Home" spot in the center; the hard one contains "danger" zones that remove any sliders that land on them. The second pro for Sorry Sliders is that it is very kid friendly (and, for that matter, targeted at kids). It's ages 6+, but could probably be played with 3-4 year olds. I'm not really sure that it is more kid friendly than other dexterity games (what kid doesn't like flicking things around?) except that the pieces might be a bit heftier, and so they might be able to handle a bit more abuse. Plus, if your kids completely destroy it, you're out $20 instead of $50+ (depending on what else you play with them). However, though I liked those two things about the game, there were a few things I was disappointed by. Our first game we played four player, and so we used the basic four player setup - a scoring pad surrounded by a ramp on each side. This, essentially, doesn't work with adults. If you're playing with really young children, this might work out, but for adults, this just means that all of the sliders clump up into the middle. And, once a few of them are there, it forms a giant blob of pieces that aren't easily moved. So, instead of having skill or strategy, you're just ramming your pieces into all the ones that are already there. We wrote off this configuration and started playing others. These new configurations lead to my next con - I don't feel like you have as much control over your sliders as you do in other dexterity games. We switched to the configuration with three ramps in a row leading to a scoring pad. This made the game much better, but we found ourselves just clumping on the back of the track. In order to get enough power to get onto the scoring pad, you almost always will give it a bit too much power. When putting several ramps together, each ramp is at an incline, and so you have to put some extra power in order to slide uphill - and so several of these in a row will remove most of your precision. Plus, frankly, I don't think that the plastic/ball-bearing combo slides very well on the cardboard playing surface. It just isn't very smooth - and this added friction forces you to focus more on shooting with enough power instead of aiming your shots. Overall, I give Sorry Sliders a 7.0/10. I was disappointed in it, but that doesn't make it a horrible game. It's something that I would play more if other people wanted to, and that I think that you can enjoy with the right group of friends. Also, I think that kids will enjoy it. If you're looking for some other good choices for dexterity games, you might also look at Caveman Curling, Elk Fest, and AttrAction. This review is brought to you by the letter "C" - guest reviewer Chris C.
Clash of Cultures is a civilization building game for 2-4 players. It plays in about an hour per player. Designed by Christian Marcussen (also the creator of Merchants and Marauders), this game follows in a long tradition of historically-themed “4X” games, spanning back at least to the 1980 Avalon Hill classic, simply called Civilization. That board game was the inspiration for Sid Meier’s classic Civilization computer game, and this thread has bounced back and forth several times, resulting most recently in Fantasy Flight Games’ popular 2010 release, Sid Meier’s Civilization: The Board Game. I'm happy to report that Clash of Cultures stands up very nicely against these giants. 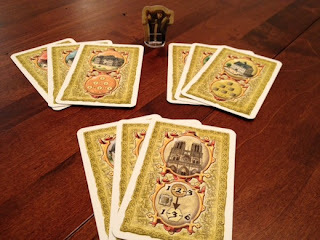 Clash of Cultures is played over six rounds of three turns each. Each turn, players take three actions. Actions include moving units, researching technologies, harvesting resources and improving cities. 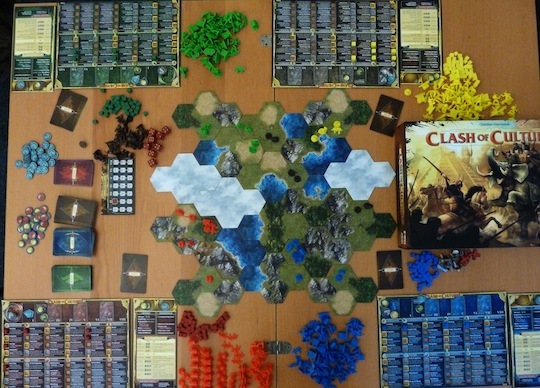 As in most civilization games, players begin with one city and a settler unit and the board is configured with randomized face-down land tiles waiting to be explored. Each round is followed by a status phase where players have an opportunity to score objectives and then receive an action card, an objective card and a free technology advance. 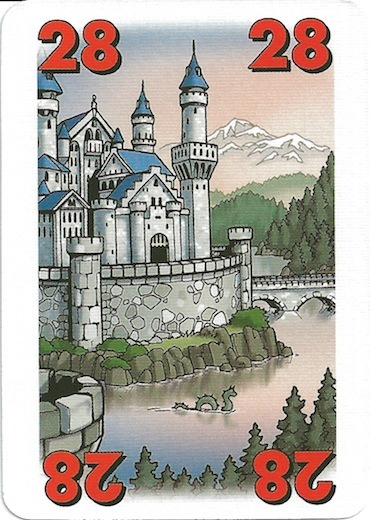 Action cards provide special abilities, while objective cards provide ways to score points. At the end of the game, players also receive points for each of their cities, their technology advances and constructed Wonders. The player with the most points wins. Cities form the heart of each player’s civilization, and the game features a number of novel related mechanics. A city may be activated as an action to harvest resources, build units or increase its size with one of the four building types - temples, academies, ports and fortresses. As a city grows larger, it can harvest more resources and build more units. However, the size of individual cities is limited by the size of a player’s civilization, providing incentive to explore and found additional cities. If a city is activated twice in the same turn, its citizens become unhappy and will be less effective. Morale can be improved using mood tokens earned by researching new technologies. The technology tree features a number of interesting options and combinations that I have not seen in previous 4X games. One example is the Trade Routes technology, which will earn players resources each turn for putting units in potentially vulnerable positions near enemy cities. 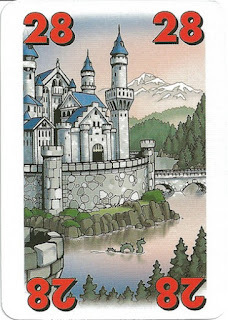 Research technologies may also trigger events, where a player draws and resolves the top card from the event deck. These can be good or bad - the player might be attacked by barbarians or simply have a good harvest. Events introduce a substantial element of luck to the game, but also add much-needed variety and replayability. The novel mechanics are supported by the excellent components. Cities are round plastic miniatures, and the buildings are on curved bases so that each fits beautifully around the city taking up a quarter of the circle. 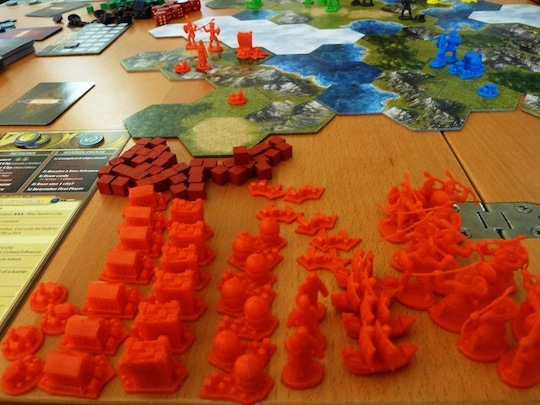 Each player receives plastic warriors, settlers and ships in their color and as they march across the landscape the game takes on an epic feel quickly. The individual player boards list the entire tech tree. They are made of thick cardboard with square holes next to each technology - when a player researches a new tech, they simply place a cube in the appropriate hole. This basic idea is a major improvement on previous 4X games, where players must often search through a deck of technology cards and refer to the manual if they wish to see all of the dependencies. Each player also gets a reference card clearly listing the game’s phases, the ways to earn points, and the cost of each unit and building. Though this game is excellent, it is not without flaws. I wish more had been done to encourage combat earlier in the game. In the groups I have played with, it is quite rare for players to attack each other before the last round of the game (and then only to attempt to capture cities containing valuable Wonders). 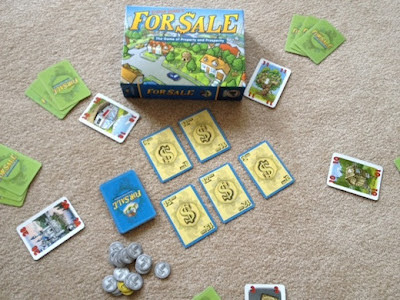 It is relatively inexpensive to found new cities, and additional cities after the first few do not benefit a player during the game, so there is little reason to attack other players earlier. As a result, the game doesn’t have as much direct interaction as one might expect from a Civilization game. This problem was solved elegantly, for example, in Empires of the Void, where mid-game scoring rounds provide an incentive to take planets from other players earlier. The game does try to encourage combat with the objective card deck. Each card lists two ways for the player to score points, one having to do with building up a civilization, and the other having to do with warfare. However, players may only complete one of the two possibilities and both are worth the same number of points. Since the civilization-building objectives are easier and combat will usually weaken the two players involved to the advantage of the other players, the groups I have played with have rarely attempted the combat objectives. Additionally, the civilization-building objectives aren’t as varied as I’d like. More than half fall into a few basic categories like building up a certain number of resources or completing a certain branch of the tech tree. And, unlike in Sid Meier’s Civilization: The Board Game, players do not have races with unique powers, so the game doesn’t feel as varied over repeat plays as I’d like. These complaints are fairly minor, considering the overall quality of the game. Any fan of Civilization-style games should pick this one up immediately. It’s also a great choice for gamers new to the genre - it has an excellent rule book and is easier to learn and play than the Sid Meier’s Civilization board game, even if it lacks a little of that game’s variety. 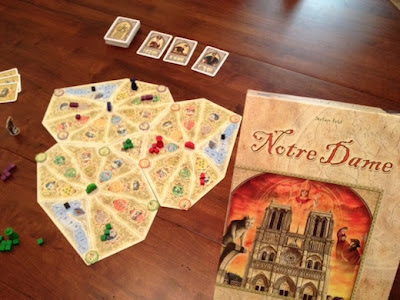 It also works very well with 2 or 3 players, which is a bit rare for this style of game. And while it might seem like a small thing, the game’s innovative components relating to cities and tech trees really make it a joy to play. If Clash of Cultures sounds interesting, you should also check out Empires of the Void, Civilization (by Fantasy Flight Games), and Civilization (by Eagle Games). 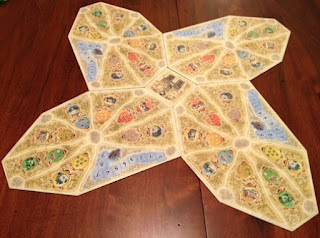 I would like to thank Z-Man Games for providing Board Game Reviews by Josh with a review copy of Clash of Cultures. 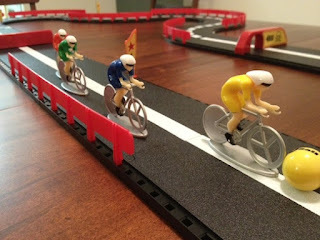 Since I'm a sucker for basically all dexterity games, I was very excited when I got to try out Bisikle (which is the same game as Roadzters, except that one uses bikes, and one uses cars - and the cars have ramps on the back of them). Set the Z-Ball in front of your bike and let it rip! When it comes to pros for Bisikle, there is one aspect of the game that is far better than anything else - the track. The track is amazing. It is made of plastic, and each section interlocks with the others. The game comes with risers, so you can decide to make certain sections be different levels. It also comes with a jump and an obstacle, each of which can allow you to customize your track however you would like. It also comes with fences that you can put around the edge of some of the track pieces - and the track is setup so that you can put the fence on either side of it (or both). Overall, it is highly customizable. And, what's more - there are no uneven spots! 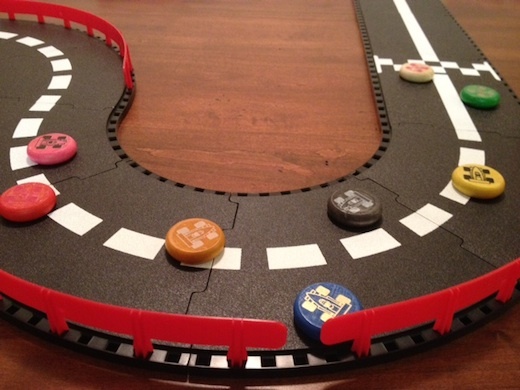 I assume that this is because it is made out of plastic instead of wood, but whereas PitchCar's uneven spots are enough to make me want to flip the table occasionally (I "normally" just pantomime it instead), Bisikle's track doesn't have any of these! The track works with PitchCar disks. The disks even fit through the obstacles (though just barely). I also tried it with Crokinole disks (to see if you could essentially play PitchCar for significantly cheaper), but they don't quite fit through the obstacles. Really, I think the best disks if you wanted to actually use the obstacles would be PitchCar Mini disks. None of them will work well with the jump - your disk will catch the lip of it and flip. The plastic, of course, plays a bit differently than the hard wood surface of PitchCar, and the fences are much bouncier, but you can definitely play it this way. I haven't decided if I prefer it, but I definitely like the fact that it doesn't have uneven spots. And that it is a lot cheaper to buy and customize your track. Overall, I give Bisikle an 8.0/10. It is a fun game on it's own, though it probably won't replace PitchCar for me - yet the track is good enough that it might replace my PitchCar tracks; I haven't really decided on that part yet. If you like dexterity games, you might also check out Crokinole, Catacombs, and Caveman Curling. A neat looking little dexterity game that I've wanted to try for a few months is AttrAction (sorry, no Amazon link). In AttrAction, the players are shooting magnets in order to cause them to cluster. 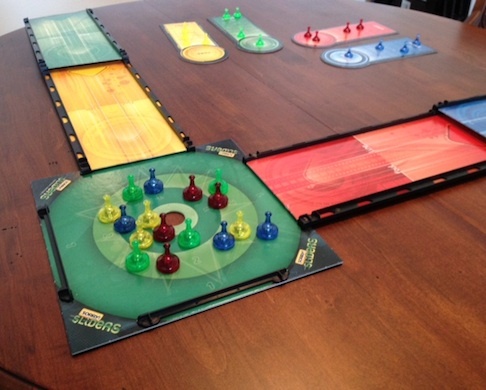 Each turn, the current player takes one of his previously collected magnets (or a magnet from the table if he doesn't have any), and uses it as a "shooter" and flicks it towards the magnets on the table. If he successfully causes a cluster (or several clusters), then he is allowed to take the largest cluster that he formed. Otherwise, his shooter remains on the table. 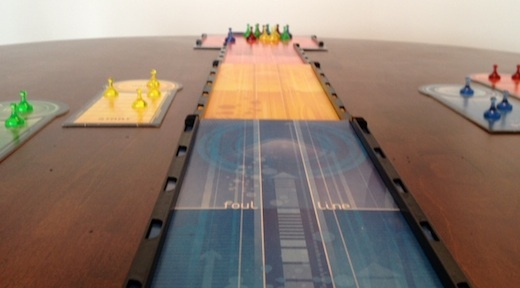 If any magnets are knocked off of the table, then the player to the current player's left gets to collect them. Play continues like this until there are no magnets remaining on the table - at which time the person with the most magnets wins. However, there are two sides to playing with magnets. (That was a pun - did you get it?) When you flick your shooter into another magnet, if the wrong sides are facing each other, then they will repel. And, this can be fun to watch, but can also be frustrating when playing the game. Early in the game, when there are still a lot of magnets on the table, this doesn't matter especially much - if you are repelled by one magnet, you will most likely be pushed into another magnet, and there will be a chain reaction that causes a cluster to be formed. But, late in the game, the magnets repelling each other can become more frustrating, and sometimes causes the game to slow down considerably. When there are only a few magnets left on the table, and they are not anywhere near each other, then each shot is basically an attempt to secure a single magnet. If they attract each other, then this comes down to a skill challenge, but if they repel each other, then your shot will increase the number of magnets on the table and lead to more turns being needed to complete the game. (Oh, and that can also be frustrating.) I wish the magnets had been marked in some way so that you could know which sides would attract and which would repel. This would allow the game to be more skill based, and would prevent this luck element that occurs towards the end of the game. So, ultimately, in AttrAction, the game has two phases - the initial phase where the game is incredibly fun, as you shoot your magnet into a large pile of magnets, and then a slower "cleanup" phase where you are taking turns shooting at individual magnets and hoping that they don't repel. And, the game supports 2-5 players. 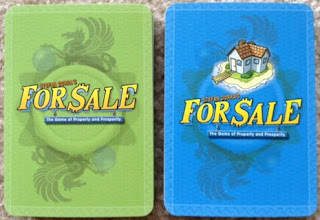 If you are playing with two players, then the number of magnets might be about right to make sure that the faster paced section of the game lasts quite a while, but as you play with more players, you will have very few turns where you get to try to collect a lot of magnets in a single turn. After thinking about this issue, I realized that I really do enjoy the first part of the game quite a bit. So, one thing that I'm considering is buying more copies of AttrAction (its MSRP is only around $15) and combining them to have more magnets. If I do this, I might also change the end of the game to be triggered when there are only five magnets on the table, or something similar. Overall, I give AttrAction an 8.0/10. I spent quite a while looking forward to this game, and it is exactly what I expected it to be. Now, I just need to decide if I'm going to buy more sets, or if I'm going to be content with the 25 magnets that I have. If AttrAction sounds interesting, you might also check out Sorry! Sliders, Crokinole, and PitchCar. I would like to thank R&R Games for providing me with a review copy of AttrAction.